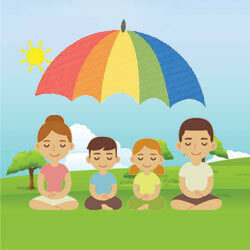 United India Insurance Company is one of the renowoned insurers of India. It was established on 18th February in 1938. There are around 22 insurance establishments merged to form United India Insurance. After the nationalization, the company registered a rapid growth. It has around 18300 employees who are spread across 1340 offices all over India. The company is one of the oldest and trustworthy insurance companies in India. The company caters into almost every section of the general insurance industry. It has its headquarters in Chennai. It offers a wide range of products and that too at an affordable price. On an average, the company provides insurance policies to around 1 crore users. The company caters into Health insurance, travel insurance, motor insurance, and business insurance so you have multiple options to choose from. The company carries the experience of almost two decades in the same. It believes in complete customer satisfaction and thus tries to help them in every possible manner. United India Insurance has the capacity to meet the needs of the consumer easily, whether it is for individual or for bigger groups. All plans are designed in a way that can go well with the requirements of consumers and can offer wider coverage. In terms of claim settlement, the company carries a good reputation. The company has successfully provided insurance services to well-known and big organizations like ONGC Ltd, Mumbai International Airport Ltd among others. The United India Insurance Company(UIIC) is the first insurer to offer valuable coverage to the rural people. United India Insurance runs effective and big scale campaigns of Universal Health Insurance Programme of Government of India & Vijaya Raji Janani Kalyan Yojana that covers 45 lakhs women in Madhya Pradesh. It further added more effective insurance policy called Tsunami Jan Bima Yojana that encompasses 4 states consisting of around 4.59 lakhs families. United India Insurance has also come out with several helpful schemes for National Livestock Insurance. It is one of the front-runners among all general insurance companies. 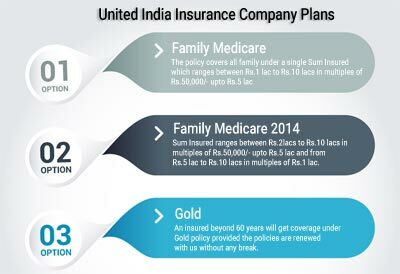 United India Insurance caters into every aspect of general insurance segment. It delivers helpful policies related to health insurance, vehicle insurance, travel insurance, rural insurance and business insurance among others. The company is into the same business from many years and has divided all products into different sections. The company is offering a wide range of effective and helpful products which will go well with different types of requirements. With the help of qualified and experienced team members, the company has been delivering an effective and wide range of products. The company believes in complete customer satisfaction hence it tries to offer effective products that can easily meet the needs of consumers. Here is the list of all the products that United India Insurance offers to you. You must go through them and choose the best one which can easily go well with your needs. United India Heath Insurance is a well-known company in the general insurance industry. It carries a good market reputation and has maintained the same for over a long period of time. The company offers effective healthcare products. It has a wide range of product so that you can easily choose the best one as per your needs. With many options it is easier for you to get the best suited one. The helpful products offered by this company will allow you to deal with any unwanted medical emergency. 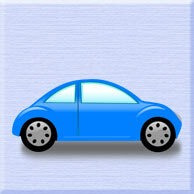 United India Car Insurance Plans - The Company also caters into the motor insurance category. It is offering an effective and wide range of the same. 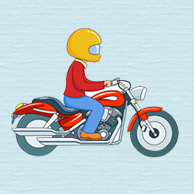 Under the same you will get comprehensive policy and liability plan for both four-wheeler and two-wheelers. All products are available at an affordable price. The company is offering several attractive bonuses under the same as well. Motor vehicle which includes private cars Motorised Two wheelers and Commercial vehicles excluding vehicles running on rails. Like other categories, the company is offering wide range of travel insurance products. You can buy it for single trip or multiple trips. There are special plans for students who stay abroad for studies. All plans come with attractive and effective features. Home is the most valued thing in a person’s life and securing the same is also essential. Thus, with the understanding of the same concept, United India Insurance is offering a wide range of home insurance products that would easily go well with your needs. An effective product for all types of business owners. Securing the business has always been a smart choice as that protects you and your business from unwanted situations or losses. You must consider buying one for your business if not already bought. Apart from the above, most popular plans, the company is dealing with several other products as well, such as shopkeeper’s policy, marine insurance, liability insurance and much more. It is advisable for all consumers to first understand their need of having an insurance policy and then go for it. With it you will be able to save a lot of money and time as well. The United India Insurance Company(UIIC) has a long history as it is in the business from the past many years. People have faith in the company and have chosen its products over a long period of time. The company has registered a fabulous growth in the last few years, which has attracted more and more customers towards it. United India Insurance Company(UIIC) is allows its users to buy effective policies online. It is easy getting the right insurance plan online as a person can easily compare the features, inclusions, exclusions of the policy. From there they can get a clear idea about the desired policy. Purchasing online is the preferred choice of many as it helps a lot in saving time and money. Through the online portal, a person can also renew its existing insurance policy easily without putting much effort into it. With this facility, you don’t have to wait in the long queues at offline offices to buy the desired policy or renewing the existing one. As discussed above the company is offering a wide range of products. Here is the list of the most common products and plans that people look for. We have divided all products into sections so that finding the best one would be easier for consumers. 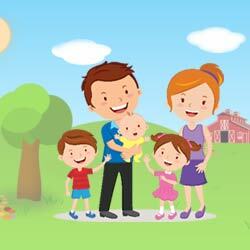 The policy covers all the members of the family under a single Sum Insured. Sum Insured ranges between Rs.1 lac to Rs.10 lacs in multiples of Rs.50,000/- upto Rs.5 lac and from Rs.5 lac to Rs.10 lacs in multiples of Rs.1 lac. It covers all members under a single Sum Insured. Family comprising of self, spouse and Dependent children can be covered. The age of the proposer shall be between 18 and 80 years. Pre-hospitalisation expenses incurred upto 30 days prior to date of admission and Post-hospitalisation expenses incurred upto 60 days from the date of discharge. Along with the basic family medicare benefits this comes out with several additional benefits.Sum Insured ranges between Rs.2lacs to Rs.10 lacs in multiples of Rs.50,000/- upto Rs.5 lac and from Rs.5 lac to Rs.10 lacs in multiples of Rs.1 lac. Pre-hospitalisation expenses incurred upto 30 days prior to date of admission and Post-hospitalisation expenses incurred upto 60 days from the date of discharge subject to a maximum limit of 10% of the Sum Insured. The entry age for this policy is between the age of 36 years and 60 years. An insured beyond 60 years will get coverage under Gold policy provided the policies are renewed with us without any break. Children between the age of 3 months and 18 years may be covered provided either or both parents are covered concurrently. Sum Insured offered by us is between Rs.1 lac to Rs.5 lacs in multiples of Rs.50,000/-. Free Look period of 15 days shall be applicable at the inception of the first policy. Cashless facility in more than 7000 hospitals across Pan India. This effective health insurance plans offers the desired coverage agaisnt specific diseases or any bodily injury that takes place because of an accident or unwanted emergency. It offers coverage against hospitalization expenses against treatment of illness/disease/injury sustained or contracted by the insured during the policy period.The policy also covers certain Day Care procedures. The entry age for this policy is between the age of 18 years and 35 years. An insured beyond 35 years shall continue to be covered under Platinum policy provided the policies are renewed with us without any break. Sum Insured offered by us is between Rs.1 lac and Rs.10 lacs in multiples of Rs.50,000/-. One of the effective health insurance plan by for senior citizen section. It comes out with great benefits and wider coverage. Pre-hospitalisation expenses incurred upto 30 days prior to date of admission and Post-hospitalisation expenses incurred upto 60 days from the date of discharge – actual expenses or 10% of the Sum Insured whichever is less. Free Medical check-up once at the end of every three underwriting years provided no claims reported during the block and subject to policy renewed without any break. The Policy covers hospitalization expenses reasonably and necessarily incurred in India for treatment of illness/disease/injury sustained or contracted by the insured during the policy period. The policy also covers certain Day Care procedures. Premium paid for self, spouse, dependent children and dependent parents are exempt from Income Tax under Section 80-D. The Policy covers hospitalization expenses reasonably and necessarily incurred in India in respect of covered hospitalization during the policy period exceeding the Threshold Level or any amount reimbursed or reimbursable under any Health Insurance Policies/Reimbursement Scheme whichever is higher, upto the Sum Insured stated in the policy. The Policy is available both on Individual and Floater basis. Individual basis – All family members including the parents can be covered under single policy with difference sum insureds and threshold level. Group basis – Single Sum Insured/Thereshold level for all family members covered under the policy. Parents can take a separate policy. The age of the proposer shall be between 18 and 80 years. Children between the age of 3 months and 18 years are covered provided either or both parents are covered concurrently. Children above 18 years will cease to be covered if they are employed/self-employed or married. Various Options with different Sum Insureds and Threshold Level are available. The policy has various Sum Insured options of Rs.1 lac, Rs.3 lacs, Rs.5 lacs and Rs.10 lacs. The policy has a waiting period of 90 days from date of inception of policy and a survival period of 30 days from date of diagnosis. The policy covers hospitalization expenses incurred on account of Accident to the Workmen during and in the course of the employment. The target segment for this policy would be Factory Owners/Contractors/Other Commercial Establishment looking for limited Medical cover for Workers/Employees arising out of accidents in the course of employment. Optional Sum Insured of Rs.50,000/-, Rs.1 lac & Rs.1.5 lacs. Our Baggage Insurance Policy covers all accompanied baggage during a journey like suitcases trunks etc. containing the baggage and additions during the journey. The policy pays for the contents of the baggage damaged/lost due to any of the perils stated above on a strict basis of indemnity. Popularly known as third party liability. It is a mandatory plan that every vehicle owner should have while driving. Under the same, you will get wider coverage that can easily go well with your needs. It is an effective, comprehensive motor insurance plan that offers wide coverage to your vehicle and protects the same from unwanted situations. It also secures you. Under the same you will get several discount and bonuses also. 1. What would happen in the case of renewal after one year? Usually the company sends the renewal notice/reminder prior to the expiration date so that you can easily renew your policy on time. Rest, you can consult the company for the same procedure. 2. How many times can I file a claim? Basically, there is no restriction related to the claim. You can file a claim anytime you want. The company will be there to help you in every possible manner. 3. What if I cancel the policy? Once you cancel the policy, then the product will not exist for you. The process of refund varies from person to person and plan to plan. 4. Does any health policy cover the treatment for existing disease also? Normally a company would not entertain the coverage of existing diseases and you won't be able to get the financial assistance for the same. Still, there are several plans in the market that would offer special coverage for the same. 5. Is a medical checkup necessary before buying a Health policy? 6. Can I avail this policy if I am not an Indian National but living in India? Yes, you can easily get a health insurance plan in India. However, the coverage would be restricted to India.